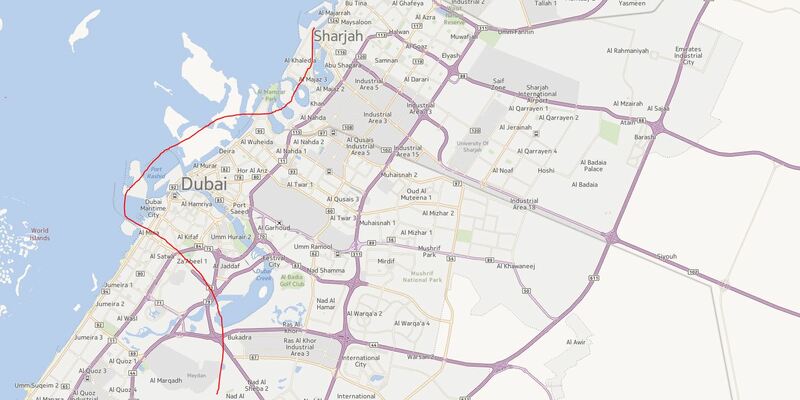 Controversy has erupted about how to connect Dubai to the new emirates rail network. Original plans for a high speed rail connection between Dubai and Abu Dhabi appear to have been put on hold as the focus has switched to adding some passenger services to the freight focused Eitihad rail network which will begin its phased opening next year. The network will effectively bypass Dubai making a direct passenger connection difficult and of course Dubai is a city that grew up around rods making a rail connection to central higher density areas rather difficult. Hence the proposal is for two or possibly three peripheral rail stations, one serving the new Maktoum airport next to the Dubai Expo site , Dubailand (possibly) and in the Meydan area, a largely as yet undeveloped area around the main race course in Dubai and the closest of the three to the historic core of the ‘Old Dubai’ at Deira and Bur Dubai. The other two stations would serve the ‘new Dubai’ growing up to the West of the City towards Abu Dhabi. The plan is to study metro extensions to connect the Eithad Rail stations to the Dubai metro system. There is many reasons to suggest that this would not be a viable rail connection. I share the concerns of the former head of the Dubai RTA Eisa Al Dossari now head of Eisa Transport consultancy. You would take 20 minutes to get from Diera to the new Meydan station by rail and then as the connection would be on tracks designed for freight by a circuitous route they would be unlikely to travel very fast, probably not even 200 kph. You can drive to Abu Dhabi or go by express coach in just over an hour and the rail route would be likely slower, so it would not be attractive for modal switch. 1. Reserve a rail corridor through the ‘new Dubai’ between at least the Abu Dhabi corridor to Maktoum, Dubailand and Maydan, this routing is fairly obvious. Make the reservation wide enough for conventional and high speed tracks in parallel. You make a similar reservation in Abu Dhabi through the new islands to the North of Abu Dhabi island. You design the stations to have capacity for future higher speed platforms. 2. The required stations on the line would be a little too close to make full 300kph HSR feasible, even with Japenese Shinkansen lightweight trains which can stop every 30-40 km. Instead you opt for Javelin class 200kph trains enabling more intermediate stations serving the New Dubai, Yas Island in Abu Dhabi etc. 3. At the Dubai end ensure the network penetrates eastwards – this can be done. With 200 KPH speeds the curve radius geometries become less demanding. The trick I think is to come south of Meydan racecourse not north and then curve towards the coast along Highway 73 Second Zabeell Road. Once you get through this web of roads and across the creek it becomes much easier as you could integrate the route with the as yet to be built or completed megaprojects at Dubai Maritime City, Port Rashid, and Diera Island, with main Dubai Station being on Diera Island easy to connect by Metro with the existing network. Then making a connection to Shariah (Rolla Centre) is surprisingly straightforward as you can cut across the largely undeveloped lagoons and then have a main Sharjah station in a redeveloped King Khalid harbour. From there connecting to Ajman is difficult, and likely would require with an elevated or causeway link – but once into Ajman the link northwards to RAK is straightforward and would open up some prime undeveloped megaproject sites at 3 or 4 points all of which would now become within easy commuting distance of Dubai. This would rebalence Dubai, from spreading out solely to the south east (sprawl) to balanced growth to Abdu Dhaabi and to the Northern Emirates, with the Dubai-Ajaman -Sharjah Uran hub around Bur-Dubai-Diera-Rolla and Al Bustan city centres at its core – now finally well connected by public transport. At Abu Dhabi the central station would be at Al Reem Island with intermediate stations at other new Islands. I suspect the land value uplift along the route would be such as to fully pay for the scheme if captured. 4. This ‘Union Rail’ could form the focus of a a much needed urban strategy for the DAS (Dubai Ajman Sharjah) Metropolitan Area and its connections to Abd Dhabi and the Northern Emirates. If growth solely occurs towards the ‘New Dubai’ around Jebel Ali and Maktoum then it will be car orientated sprawl, but if it is focused around public transport, which connections through to the urban core and opens up new public transport foccussed megaprojects to the north the load across the transport network becomes less imbalanced and finally the Bur-Dubai-Diera-Rolla -Al Bustan urban hub becomes the well connected heart of the Metropolitan area rather than its declining and neglected residual left increasingly to its poorer residents only. well connectivity should be consider on prime issue as most of the development depend on the transport connectivity. Area which has easy access get faster developed.